Join us on Wednesday, January 17 at 2 p.m. as we celebrate the grand opening of this 1.2-mile-long segment of the East Lake Sammamish Trail. After a brief ribbon cutting ceremony and award presentation, we will have family-friendly trailside activities, hot beverages, and light snacks - all courtesy of King County Parks. And for those of you who ride bicycles, Cascade Bicycle Club will be on hand with their mobile tune-up station. Trail Plaza at SE 33rd St. Please RSVP so we can get an accurate headcount for refreshments! Event Location: Intersection of ELST and SE 33rd St., across East Lake Sammamish Parkway from Uncle Si's Pizza and Big Block Brewing. *Please don't park in the parking area for these establishments. Event Parking: We strongly encourage everyone to take alternative transportation to the event. Vehicle parking will be available at the Lake Sammamish State Park Boat Launch (see map above). Please use your discovery pass or print this invitation to display on your dashboard. The event site is 1.5 miles north of the boat launch parking area. 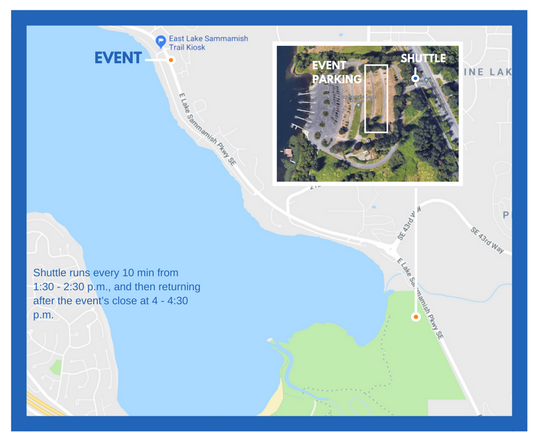 For those that can't walk or bike the distance to the event, King County Parks is providing an on-trail shuttle between the parking lot and event site, running every 10 minutes from 1:30-2:30 p.m. to the event site and returning to the parking lot after the event's end until 4:30 p.m.
See you on Jan 17th - Please RSVP if you plan to attend this event!